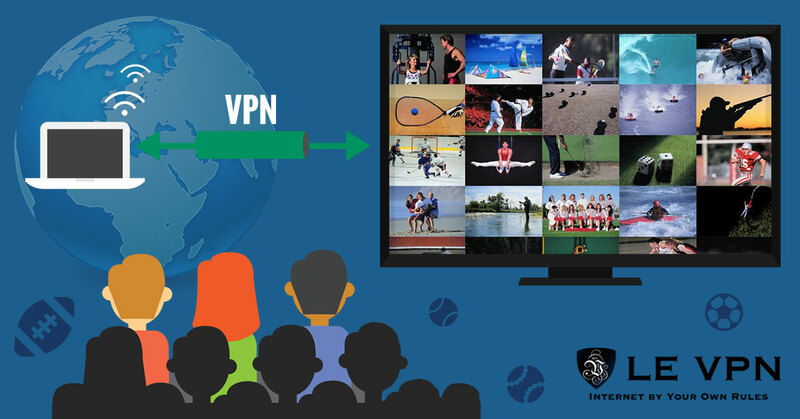 The World Cup, 2016 Summer Olympics, the UEFA Euro, the Tour de France, the British Open, the International Champions Cup, CrossFit Games, soccer championships, rugby championships … if you’re a fan of global sports and don’t want to miss one exciting live-action minute, subscribing to a VPN to watch sports should be No. 1 on today’s to-do list. Nothing is more frustrating than living in a country that does not provide live broadcasts of your favorite sports events. Who wants to find out about a thrilling, last-second win by their favorite team via Twitter or watch secondhand videos? For example, if you live in Germany, Canada or any country that geographically restricts your ability to watch sports and want to watch a Brazilian soccer game in real time, subscribing to a VPN for live sports streaming means you get an instant, front-row seat without leaving your home. In addition, using Le VPN to watch sporting events and other online media conceals your IP address and securely protects your internet connection from unwanted attention. If you live in a country that blocks American channels like ABC or NBC, subscribing to a VPN lets you anonymously connect to a VPN server in your country so you enjoy fast browsing speed while watching a U.S. channel. A virtual private network works with all internet-enabled devices and operates on nearly all operating systems. All you need to do to start watching your favorite sports without restrictions is subscribe to Le VPN, set up the software on the device of your choice and connect to servers providing reliably fast, endless streaming of your favorite sports events. Bookmark our International Sports Calendar page not to miss out on the biggest international sports events of the year! DDoS attacks are common in countries where access to the internet is restricted. If you want to watch out-of-country sporting events without worrying about security or compromising your anonymity, you need Le VPN. It’s encrypted, provides strong DDoS protection and dramatically enhances the thrill of watching a major sport event without worrying about security. Using a VPN to watch international sports may seem complicated, but it doesn’t have to be. Getting set up with Le VPN takes just minutes. There’s no additional hardware to purchase and no complicated settings to worry about – our sophisticated, straightforward platform takes care of everything. All you have to do is open our program on the device of your choice, select the location of the server you want to connect to – for example, if you want to watch the BBC’s Six Nations rugby coverage, connect to a British server – and that’s it. Our software is available for all major platforms, including Windows, Mac OS, iOS, Android, Linux and more. Sign up today and in just minutes you can be using a VPN to watch foreign sports channels from around the world. By far the biggest benefit to using a VPN to watch sports online is the expanded range of international programming you gain access to. Even if it’s a globally televised event such as the 2018 World Cup streaming, a VPN can let you watch it in the language of your choice, with the incisive, entertaining commentary you enjoy. Whether you’re traveling abroad or have moved permanently – or simply want to watch the sports you love from another culture’s perspective – a VPN provides you with an almost unlimited selection of games from around the world. Watch Australian rules football, curling, jai alai and other great international sporting events you simply can’t find where you are. A VPN offers more than just a better selection. It’s also a safer way to access the Internet. Any broadcast that requires your email address or other personal information to watch puts you at risk of a hack. A VPN is the best way to protect your private data, particularly if you’re watching international sports over an unsecure or public Wi-Fi network. For the best experience, be sure to choose a provider with advanced encryption protocols, such as Le VPN. Even if you’re not directly at risk, a VPN helps you cover your tracks and lets you watch the content you want without attracting attention. Want to get up-to-the-minute updates of the big game while at work, without your employer knowing? Need to get around a corporate firewall? You can with Le VPN. If you’re serious about sports, there’s no better way to maintain your privacy while streaming global coverage over the Internet. Still not convinced about the many benefits of using a VPN to watch the World Cup or other foreign sporting events? Enjoy a seven-day free trial of our fast and easy-to-use service to see it in action for yourself. Subscribe to Le VPN today to receive immediate activation, access to IP addresses in more than 114 countries, unlimited data transfer, high-speed SmartDNS for watching out-of-country television channels, iOS apps and many more benefits. Your sports event is on now! Don’t miss a minute of the action – subscribe to Le VPN today.